For students who are interested in becoming a speech-language pathologist, the Master of Arts in Communication Sciences and Disorders education program at the University of Florida offers a comprehensive program of academic and clinical education. Our program combines active classroom-based learning with an assortment of evidence-based, “hands on” learning opportunities at the many clinical practicum sites available on or near the University of Florida campus. Graduates of our program can expect to develop the knowledge and skills that are needed to deliver evidence-based clinical services to a wide range of populations in a variety of clinical settings. The mission of the Master of Arts program in Communication Sciences and Disorders education program is to prepare students to become speech-language pathologists who work to preserve, promote, and improve the functioning and general well-being of individuals who wish to improve functioning in the areas of communication and swallowing. The goal of our program is to prepare professionals who are well qualified for employment in a range of education- and health-related settings and who, once employed, are recognized for their competence, leadership, ethics, and commitment to service and life-long learning. Our program strives to attain this goal by developing students who can independently design and deliver effective, culturally sensitive, and evidenced-based clinical services to individuals with differences or disorders in communication and swallowing. Toward this end, our program strives to provide students with a high-quality academic and clinical experience that is directed by an internationally recognized faculty and based upon cutting-edge research, active learning, expert mentoring, and spirited engagement in service activities. Our program primarily is oriented toward developing students’ clinical competence; however, our students also have access to a range of opportunities for developing skills in basic and applied research. Students who elect to enter the thesis track of the program conduct original research in laboratory and real-world settings under the mentorship of faculty who are widely recognized for their research accomplishments. Students typically take five semesters to complete the program. Our primary academic classes usually have enrollments of 25 to 30 students. This means that students can expect to have ample access to our professors and clinical educators. 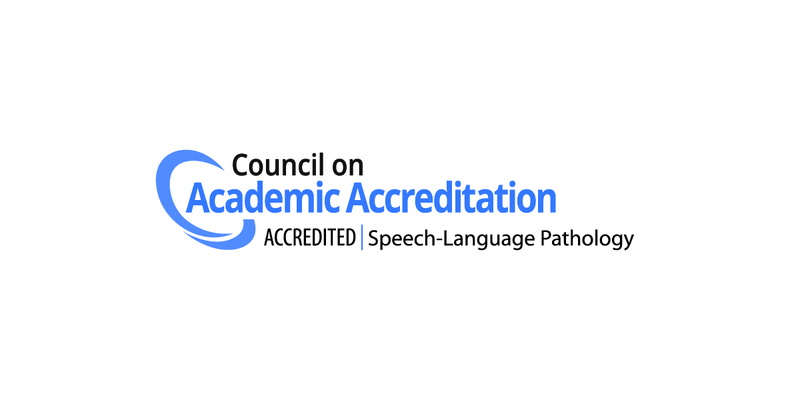 We have included an ample amount of information about our program in this section of our website; however, for additional details about the program, please consult the “EdFind” database on the website of the American Speech-Language-Hearing Association. For more information about graduate admissions, click here. The student achievement outcomes described below are for the Master of Arts program in Communication Sciences and Disorders education program, and are reported as averages over a three-year span based on combined data from the 2015-2016, 2016-2017, and 2017-2018 academic years. In the reporting period, 81 students completed the program, and all of them did so in the expected time frame. Thus, the three-year average for completing the program in the expected time frame was 100%. In the reporting period, 74 students reported Praxis examination results to the program. Of the 74 students, 73 attained passing scores. Thus, the three-year average for passing the Praxis was 98.65%. All of the passing scores were on the first attempt at the Exam. The average score for all test-takers’ first attempts on the examination was 183.31. In the reporting period, employment information was available for 81 graduates of the program. All of these graduates reported being employed as a speech-language pathologist. Thus, the three-year average for employment in the profession was 100%. The Master of Arts in Communication Sciences and Disorders education program in speech-language pathology at the University of Florida is accredited by the Council on Academic Accreditation in Audiology and Speech-Language Pathology (CAA) of the American Speech-Language-Hearing Association, 2200 Research Boulevard, #310, Rockville, MD 20850; 800-498-2071 or 301-296-5700.